I'm getting organized a little early for next month since I have a fairly crazy few weeks ahead of me workload wise. I hope sharing this with you now helps you to stay on track if you have busy weeks ahead as well! 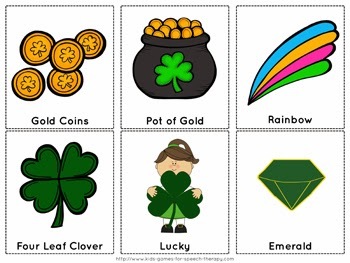 My other vocabulary cards have received great feedback so I thought I would share this set for St. Patrick's Day. Click through to my store at Speech Therapy Games to download. These are awesome- thank you! READ MY LIPS- SLP's are the best!